Custodians and owners of old books will sometimes have to make tough decisions. They want their books to be used – why else would they have them? – yet they also want them to be preserved for the future as well. 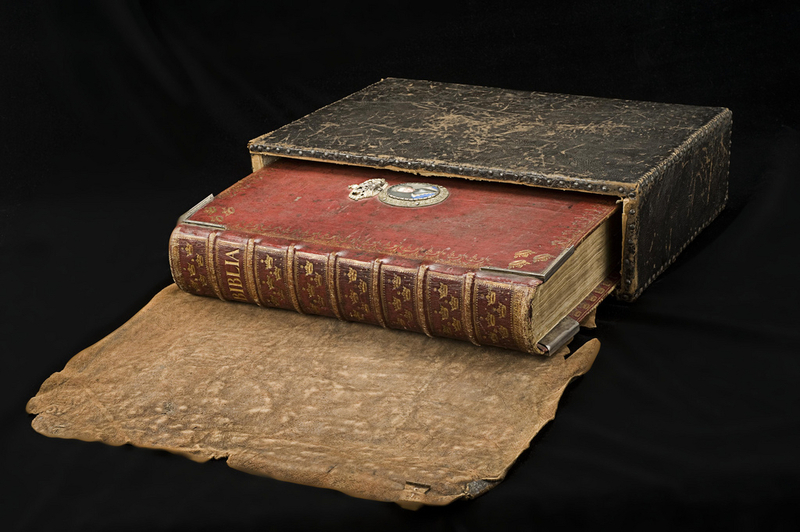 In the case of manuscripts and early printed books, the materials themselves are old and often fragile, and part of the textblock or binding may have come apart. While in most cases it would technically be possible to repair the damage, this is not always the best option for the book or the user. Instead, a conservation specialist may advise to simply box a book and not treat it at all, or propose minor treatment and consolidation only of the fragile state. Is that a result of sparse conservation budgets, or can there be other reasons? A conservator evaluates the severity of the damage. Not all deterioration processes are progressive, and some damage may have occurred centuries ago without causing problems. Other conditions, such as deformations or splits in flexing materials may cause severe threats and further loss of material. The book’s current use, its historical value, and its relation to a collection are of course factors of importance when making conservation decisions. The book as a physical object contains much more information than its contents alone; this blog demonstrates that in every posting. In spite of the fact that an increasing number of manuscripts and old prints are available online, the material object remains valuable – and may even become more valuable. One of the unique values of the physical book is that it contains historical evidence that is not accessible in a digital format. With a damaged object this information may be more easily accessible than in a well-preserved or restored book. The damage itself may reveal historical circumstances or shed light on former use, and in addition, damage may provide access to the interior of the structure. 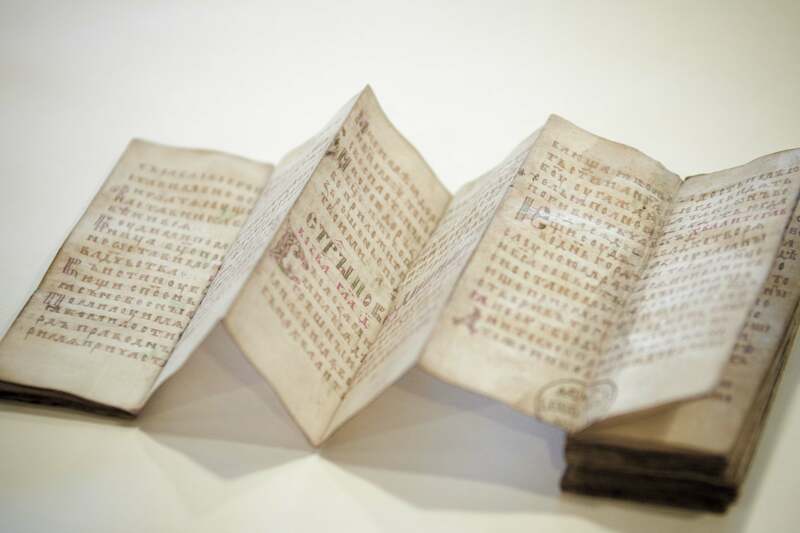 This can teach us what materials were used and what decisions the original bookbinder made, and it may connect the book to a certain region or time frame. Damage can be beneficial for book historians, and repairing damage may deprive them of valuable information. 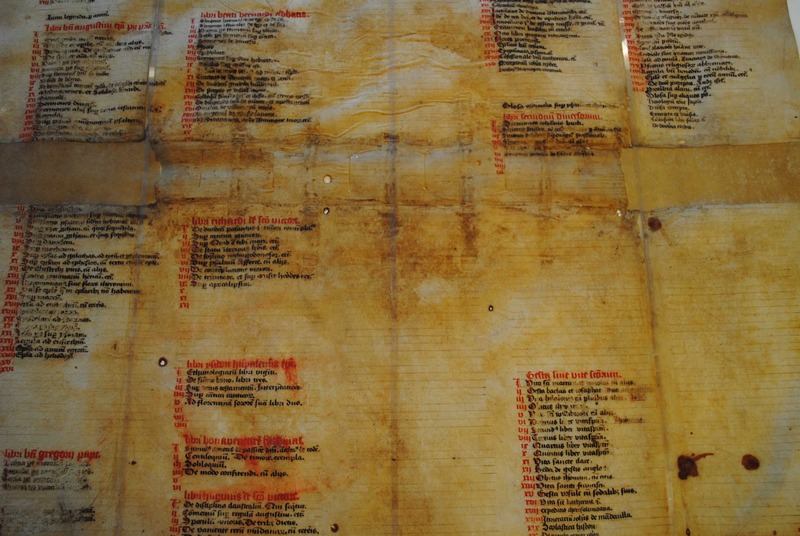 One way to safeguard such evidence is extensive documentation of the object prior to conservation treatment. However, if the condition of the book allows it, minimal intervention is an attractive option that respects the book’s integrity, and sometimes doing nothing may even be the best decision for the moment. 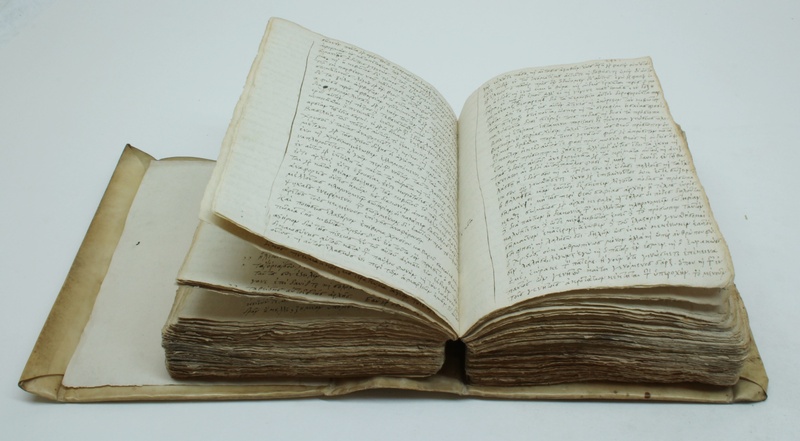 Three cases from the Leiden university collections illustrate such preservation issues and address the question whether the benefit of a conservation treatment outweighs the benefit of not treating a book. 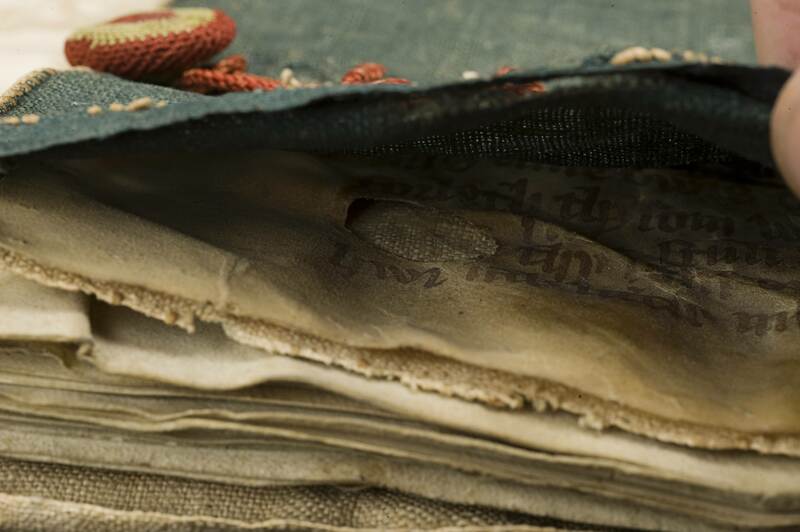 Both parchment and leather discolour over time, after which it becomes difficult to distinguish between the two materials. In addition, the ‘slotted spine’ as a technique is relatively unknown, and it is usually not easy to discern something one is not familiar with. With this particular technique, the characteristics may become more indistinct when the damaged spine of such a book is treated, and as a result an untrained eye may just be under the impression that the repaired binding is meddled with, instead of recognising the distinctive slotted method and thus the provenance. 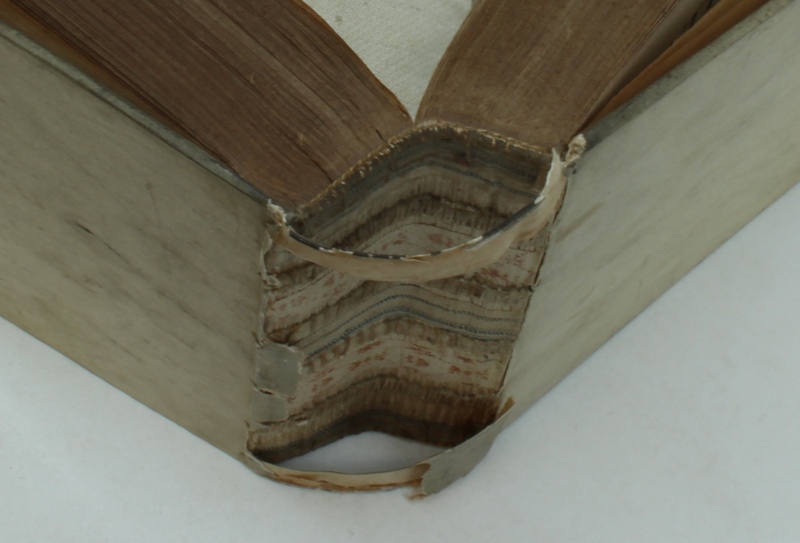 By contrast, the damaged spine of the binding in Fig. 1 invites the user to examine the different materials that are visible. Its construction is sound enough to support the textblock and allows careful use in the reading room; a box protects the binding in the stacks. In some cases the damage may appear quite severe when in fact the structure is sound and the covering material is not at risk of further loss. 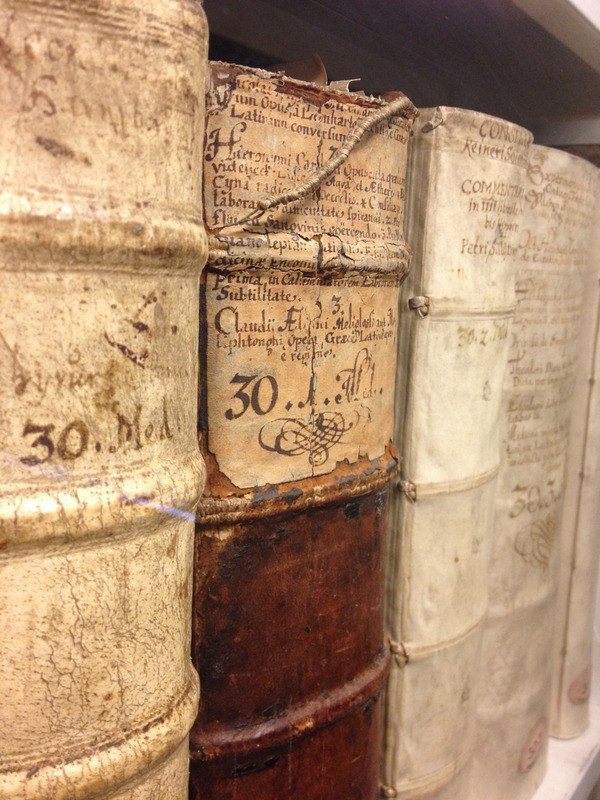 The parchment-bound books in fig. 2 are an example of that. 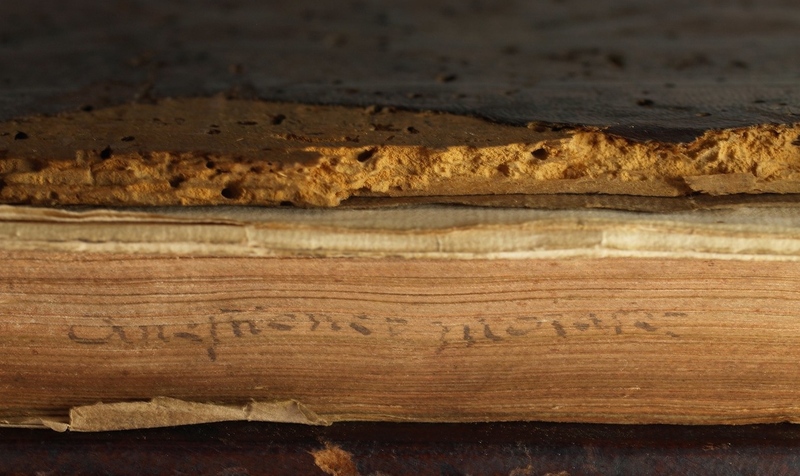 The damage is typical of bindings that suffered from too much UV-light on the spine, which caused the material to deteriorate rapidly while the similar materials in the joint and over the front and back covers were not affected. From a book-historical point of view, a new spine would not add anything: it is clear that the original binding was a laced-on full parchment cover. Instead, a new spine would cover up all the information now visible on the spine of the bookblock. Zooming in, we can see the sewing structure and the different materials that are used as spine-linings. For the book on the left, parchment fragments with musical notation were used. For the one next to it, strips of block-printed textile were applied between each sewing support to strengthen the structure. The two volumes on its right side also show the use of block-printed cloth. However, in this case the bookbinder economised – these books are only small, after all – and applied only one lining strip to each volume. What we can also see in Fig. 2 is that the binder pasted these strips, apparently arbitrarily, between the first and second sewing support in one instance, and between the second and third in the other. This is all the more interesting because the book on the far right displays a very intentional application of materials. Here we see two kinds of materials, cloth and paper. The blue striped cloth is used at head and tail, where strength of material is important to support the endband sewing, and in the middle. The paper strips with their reddish blockstamped decoration are used above and below the central cloth strip, where strength is a little less important. Thus, the structure is well balanced, not unimportant for a book of this size and weight. This case shows how it is sometimes better to do nothing, or to simply consolidate the condition (e.g. stabilising the damage, making sure that it cannot become worse) without actually repairing the damage. 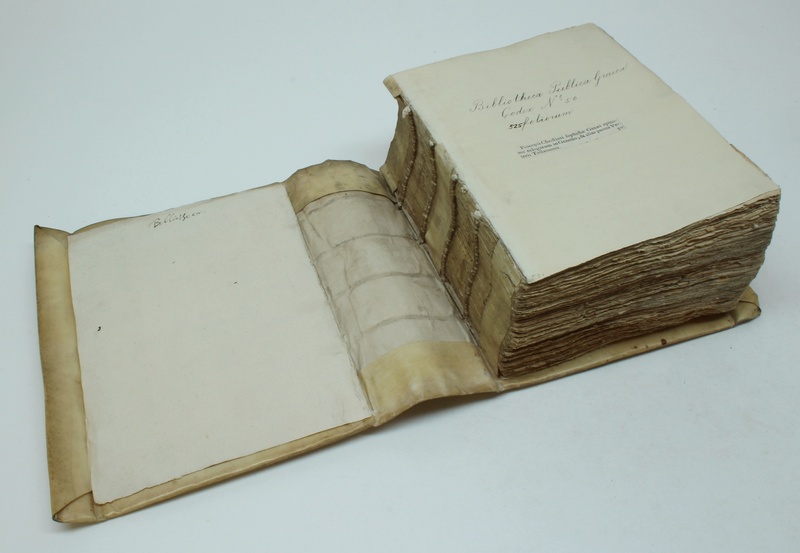 In the case of these parchment bindings, leaving the damage benefits the user and the book itself. Without the rather rigid parchment spine of the binding the book opens more easily and thus its readability improves. This means that the user will not have to put any pressure on the joints when reading, and therefore the book’s structure will hold. A new spine would change the balance and might cause damage to the weaker areas such as the joints, which are currently unbroken. As a by-product of the decision to do nothing, the conservator saves time, which can be invested in those books that are at risk of progressive damage, or are damaged in such a way that their broken structures currently do not allow for use. Different binding types have different characteristics, and the materials and techniques used to construct the book influence the objects’ physical properties and its ‘mechanism’. 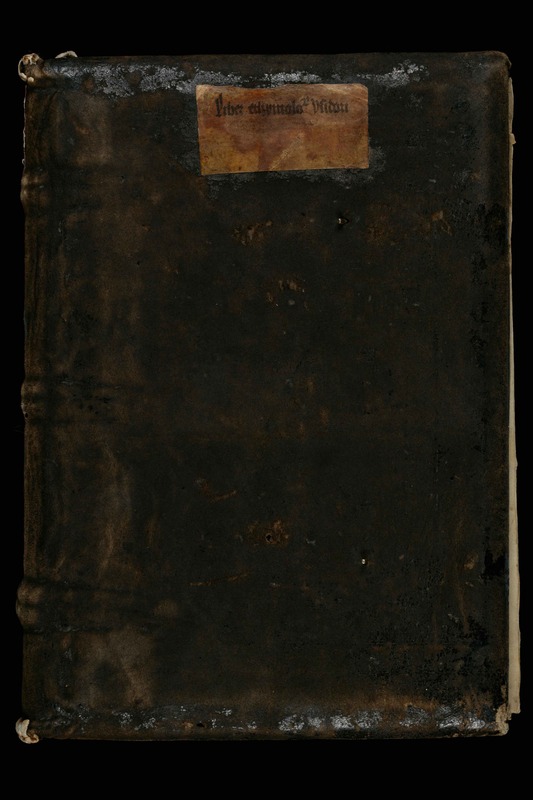 A leather covering, for example, pasted onto the spine of a manuscript, supports the textblock spine when the book is used. 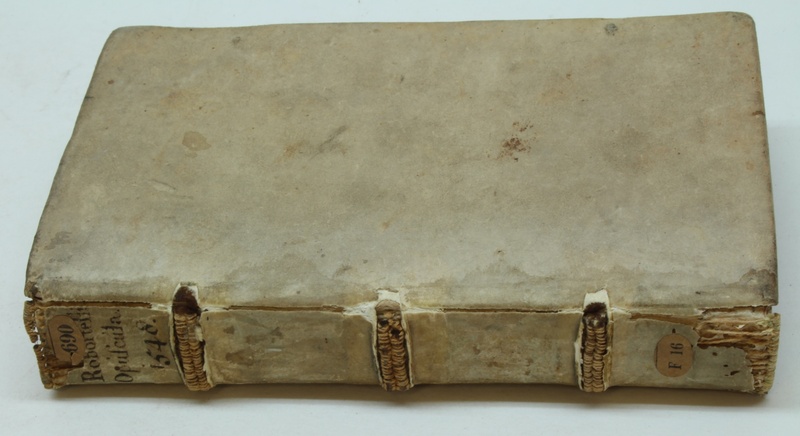 A parchment binding that is laced on to the textblock with the binding supports, but is not actually connected to the spine itself, moves away from the textblock spine when the book is opened (visible in Fig. 3) When, in addition, the spine of the binding is stiff and the textblock spine is flexible, a tension occurs which strains the joints. The Greek manuscript in Figs. 4-6 is an example of such an unfortunate combination. One of the joints gave way: the book’s solution to the problem. A conservation treatment aiming to restore the broken joint would only inflict further tension on the other joint and eventually lead to more damage and a repeated intervention. It was therefore decided to leave the damage as it is. The manuscript is accessible and safe to handle, though its uncommon condition may raise some questions at first encounter. These examples show that damage is not always a problem that needs to be solved. They do not, of course, represent all conservation issues, or every reason for choosing not to treat damage. However, if they inspire the reader to think about physical characteristics and the sensitive condition of an old volume, these objects already serve a purpose that a completely restored volume would not. What a clever device the book is. It is compact and light, yet contains hundreds of pages that hold an incredible amount of information. Moving forward or backward in the text is as easy as flipping a page, while the book’s square shape and flat bottom facilitates easy shelving. Still, the object is useless if the information it contains cannot be found. And so tools were developed to help the reader do just that, such as page numbers, running titles, and indices. As familiar as these aids may be, they are older than you think. The page number, for example, is encountered in papyrus manuscripts made some two thousand years ago (see this older blog post). Crucially, to look up information in a book you must have first located the object. And so the shelfmark was invented, the equivalent of our call number. 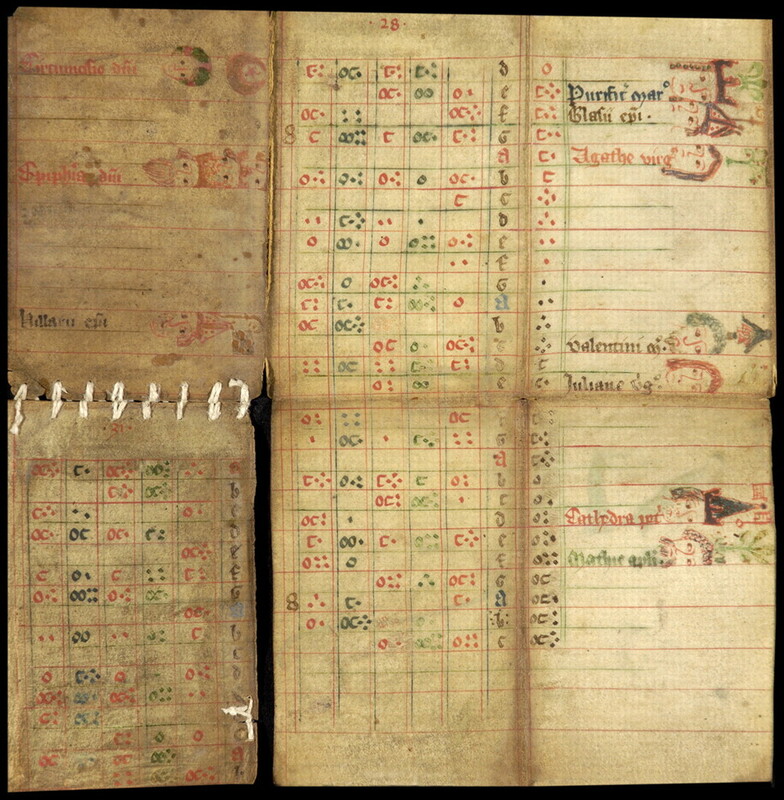 By the end of the medieval period it had become as clever as the book to which it was added: letters, digits, and even colour coding was used to guide the reader to a particular manuscript (see this post on GPS in the medieval library). 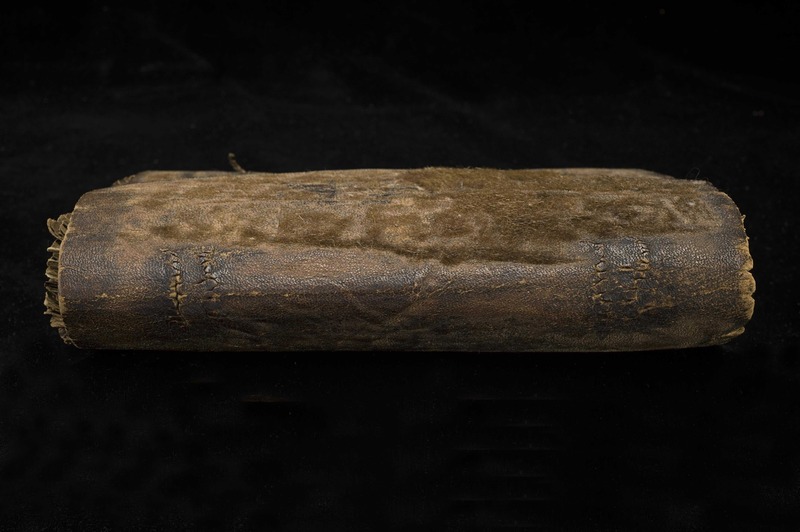 This post explores the medieval roots of yet another tool for finding a specific book, one that is as popular now as it was in medieval times: title and author information displayed on the spine and dust jacket. 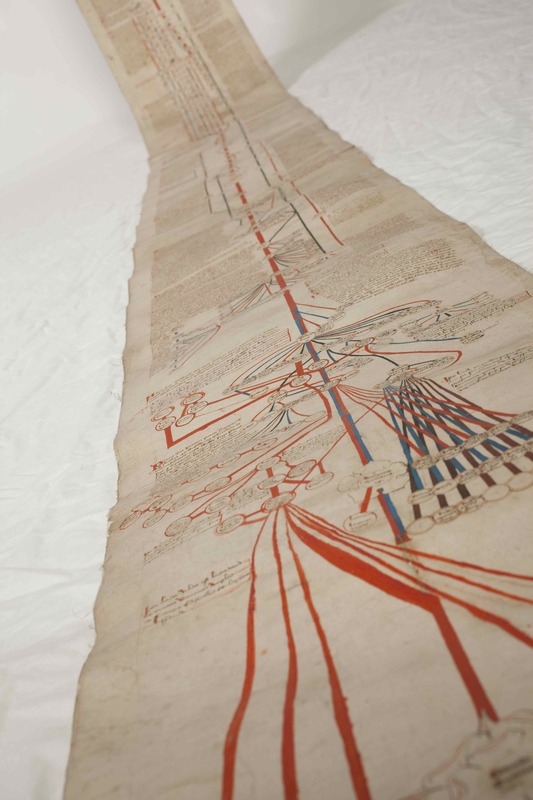 How did the outside of the medieval manuscript communicate what was hidden inside? Why make things complicated? The easiest way to identify a manuscript was to simply jot the title on the front cover, straight on the leather of the binding (Figs. 1-2). Although one might imagine that this is how the tradition of our modern cover information began, there are too few original bindings left to know for sure. The manuscript seen in Figs. 1-2 is important as it shows that the practice goes back to at least the fourteenth century. The manuscript shown in Figs. 1-2 was copied around 1100 and still has its original binding. Interestingly, this tells us that for 200-300 years users were quite content with an “anonymous” book, which did not provide a clue to what information it contained. This is all the more striking when you consider that during these three centuries the library where the object was held, in the abbey of St Gall, harboured several hundred books. 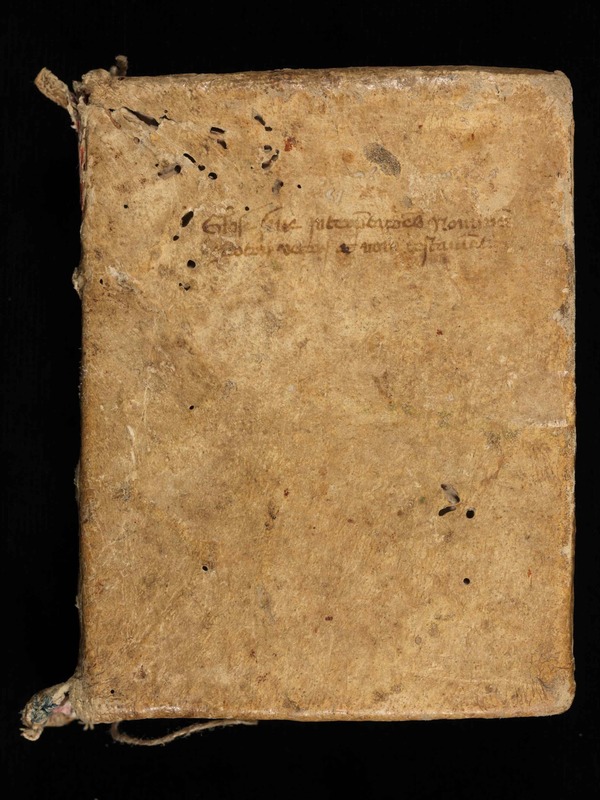 How on earth did the monks find their way to the texts contained within this binding? Writing text on a manuscript’s cover, as seen in Fig. 2, was not easy. The structure of the leather could be coarse and the surface uneven, which made it potentially difficult to write the title information legibly. More importantly, when the leather had a dark color, a black title may simply not be visible. In such cases it made more sense to write the information on a parchment or paper slip – a label – that was subsequently pasted on the cover, as is still common practice in libraries today. The manuscript in Figs. 3-4, which features a parchment label, shows how incredibly effective this practice was: it clearly reads Liber ethymolo[giarum] Isidori, telling the reader that he was about to open Isidore of Seville’s Etymologies. These paste-on labels could be quite extensive (Fig. 5). In fact, some book owners preferred to have the entire contents displayed on the outside, even if the object held ten works (Fig. 6). As detailed as these labels are, they exclusively list the titles of the works contained by the manuscript, not the authors’ names. It appears as if the librarian who labeled these manuscripts judged the title (and not the author) to be the best identifier of the object. Paper or parchment title shields were sometimes placed under a thin piece of horn (bone), for protection (Figs. 7-8). The so-called “fenestra” (window in Latin) was secured to the wooden cover with nails: it was clearly going nowhere (Fig. 8). This type of cover information can be seen as the next step in the process of providing efficient book titles: a clear and permanent label, hammered into wooden boards with nails. It is a far cry from the on-the-fly title hastily written directly on leather (here is another example). 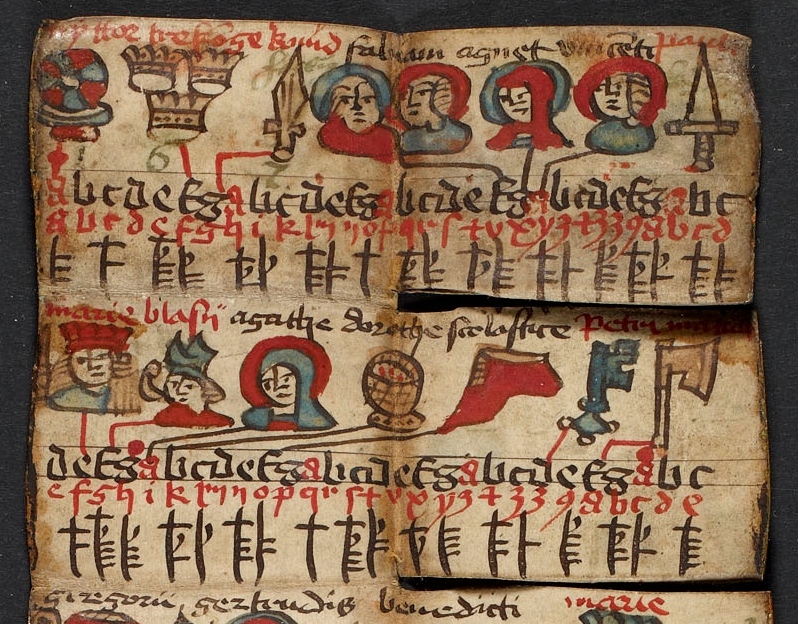 The fenestra is often found on manuscripts that were part of a well-organised library. It may therefore contain quite a bit more information than merely the title or the author. The one seen in Fig. 8 is from the library of the Carthusian house of Syon in Middlesex, England. The label is clever and reads: “V. Beda de gestis Anglorum. Idem super actus apostolorum et epistolas canonicas. 2o fo et prassini”. The main piece of information concerns what is found inside: Bede’s Ecclesiastical History of the English People and Bede’s commentaries on the Acts of the Apostles and on the New Testament’s Canonical Epistles. However, it also mentions the first words of the second folium: secundum folium [incipit] et prassini, the second folium starts with “et prassini”. These words formed a unique identifier, for no two copies of Bede’s Ecclesiastical History will have had these very words at the start of the second leaf. This technique was commonly used to identify unique copies for inclusion in a monastery’s book inventory or library catalogue. It is probable that this is the reason why the fenestra contains the phrase: to link this specific book to the monastery’s catalogue. Not only was a book’s title and name of the author jotted down on the front cover, it would ultimately also feature on the spine, as any modern reader knows. This part of the tradition has its own path of development. It all started on the fore-edge, the long side of the book that shows the paper or parchment pages. From at least the fourteenth century decoration was added to this location. Few books have been so lavishly decorated as Ordorico Pillone’s, who, around 1580, had the artist Cesare Vecellio decorate the fore-edge of 172 books in his library with stunning designs (Fig. 9). The technique would be perfected in the nineteenth century, when the magically disappearing fore-edge decoration was invented (example here). 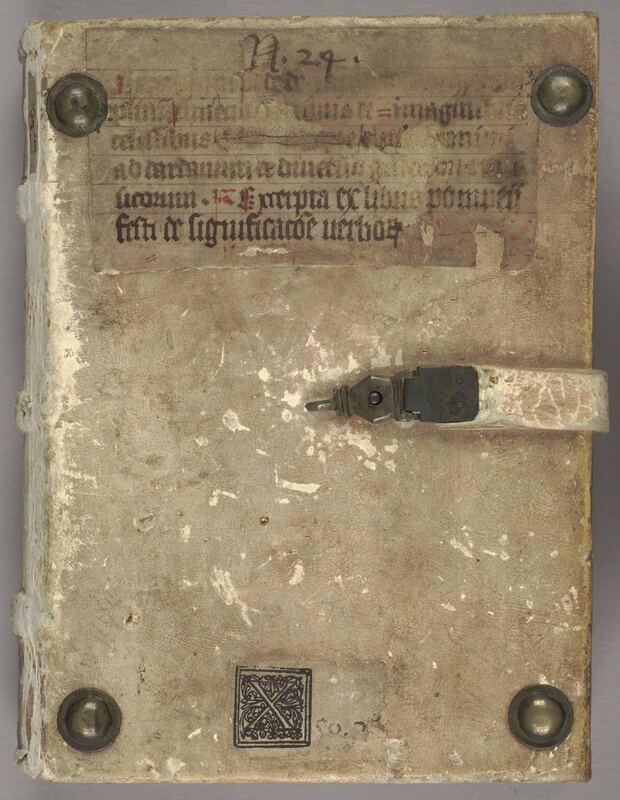 In medieval times the edges of the book block were not usually decorated, while the design was commonly modest (Fig. 10-11). Although there are exceptions to this rule, as a potentially medieval fore-edge decoration in Durham shows (more here). The manuscript in Fig. 11 shows that medieval fore-edge decoration could serve a functional purpose, because it concerns the coat of arms of Jean, duc de Berry (d. 1416). 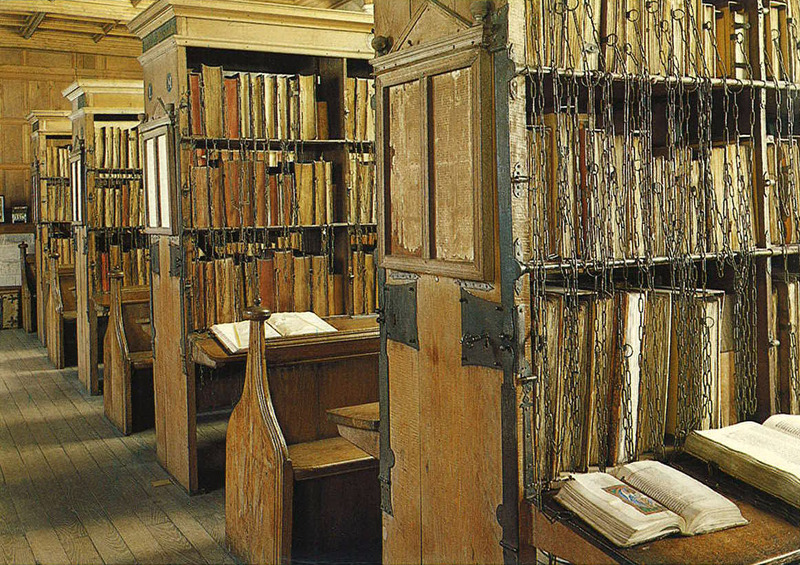 We may assume the books in his library were positioned with the fore-edge faced outward, as was common practice in many medieval libraries – in fact, this was done until well into the 17th century, as this image shows. How impressive his library must have looked to visitors: dozens of precious books, all evidently owned by the duke. Given that the fore-edge was facing the reader, this location was also the perfect place to write down the title or author of the work contained by the volume. 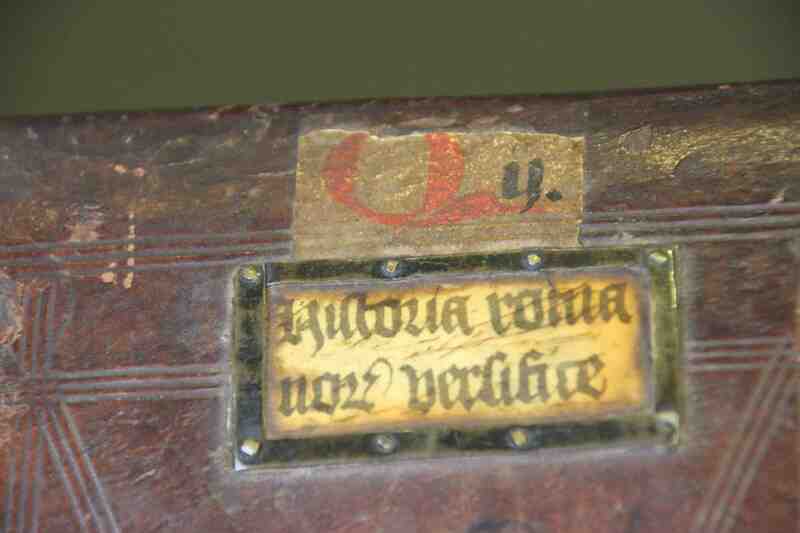 ‘Quaestiones morales’ (moral questions), a 15th-century hand wrote on the fore edge of an incunable printed in 1489 (Fig. 12). 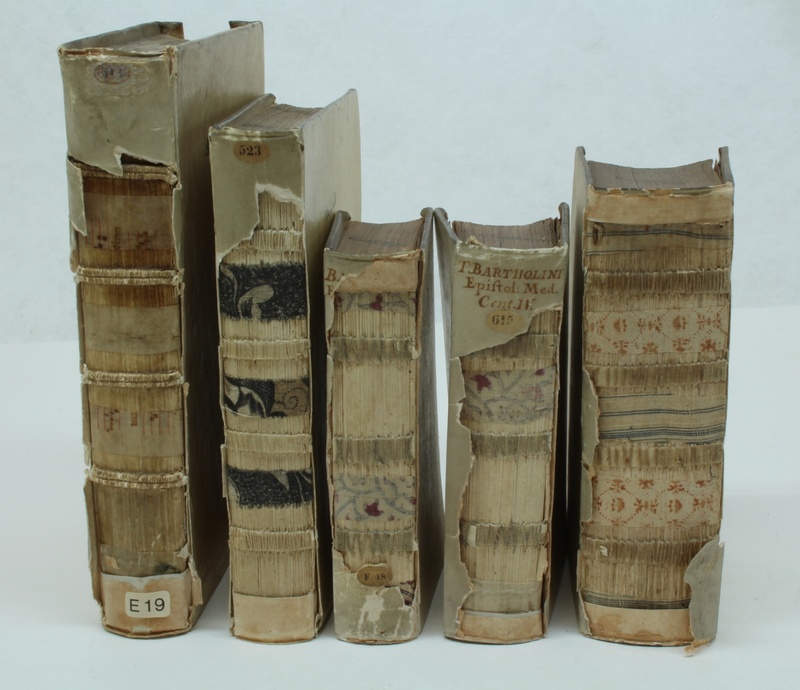 The earliest cases I encountered date from the early fifteenth century, although our view may be skewed because such fore-edge titles disappeared when binders in the early-modern period refitted the books with new bindings. When books finally turned their backs to the reader, the title ended up where it is still found today: on the spine. Based on my own experience, this practice was not common in medieval times, for the simple fact that manuscripts were not usually placed with their backs facing the reader. Cases from the early-modern period are plentiful. In fact, it became so popular that some readers wrote extensive tables of contents on the backs of their books (Fig. 13). The early history of displaying a book’s title and author on the outside is long and winding: first the information was found on the front or back, then on the fore-edge, and finally on the spine. 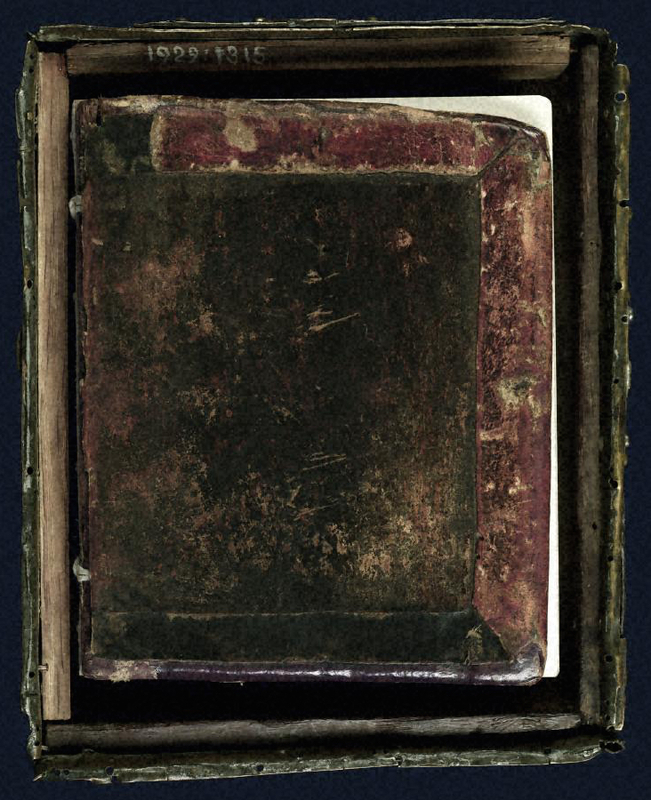 This order is no coincidence, because it roughly reflects another development, namely how books were stored: first flat (Early and Central Middle Ages), then upright with the fore-edge facing the reader (Later Middle Ages), and finally with the spine facing outward (Early Modern period). Judging from surviving book bindings, the history of the “dust jacket” with title actually starts surprisingly late. After all, the earliest traceable specimens date from the fourteenth century. Curiously, in the same century the Latin titulus was first used for denoting the title of a book (see here), which may also indicate that titles did not exist before then. If correct, this reconstruction suggests that for much of the Middle Ages readers could not tell what texts were found inside a book. Generations of frustrated monks had to wander through the library opening and closing manuscripts until they had found what they were looking for. Books in use generally reside in our hands or on our desks. This was not very different in medieval times. However, medieval and modern reading culture take different paths when it comes to books that are not in use. While both then and now the objects are commonly shelved after use, medieval readers had additional storing options: slipping the book into a box, bag or wrapper. Unfortunately, few of these exotic – and fascinating – storage devices survive today. However, the ones that do indicate that many were made with a specific purpose in mind, namely transportation. 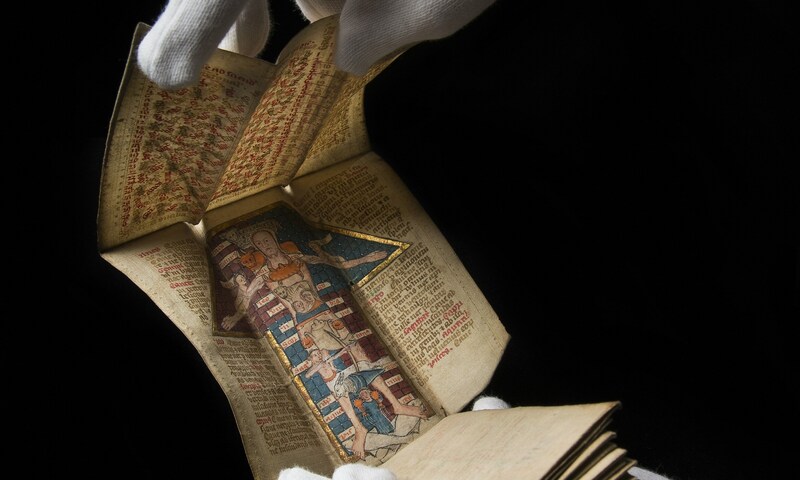 Here are some popular means of packing up your book to go in medieval times, including the precursor of our modern tablet sleeve. The book box is probably the sturdiest and most effective means to protect your book against the elements and other hostilities on the medieval road. Such boxes were usually made out of wood, to which ornaments, gems and even ivory cuttings were attached, commonly with nails. A particularly well preserved example is seen in Fig. 1. The box contains a famous book of hymns from St Gall, which was designed to be carried in processions both within the monastery and through the nearby city of St Gall. My recent post on “slim” books showed the actual book found inside this box, a narrow object designed to be held in one hand (post here, image here). Decoration on the outside of the book box not only made the object look pretty, it also gave it prestige. In fact, ivory cuttings and shiny gems reflected the importance the book had within a monastic community or a church. Book boxes actually bear a striking resemblance to medieval reliquaries, shrines or containers made for holding a relic such as the arm of a saint (example here) or a splinter of the holy cross (here). One type of book box in particular matches this profile very well: the Irish cumdach or ‘book shrine’ (Figs. 2-3). 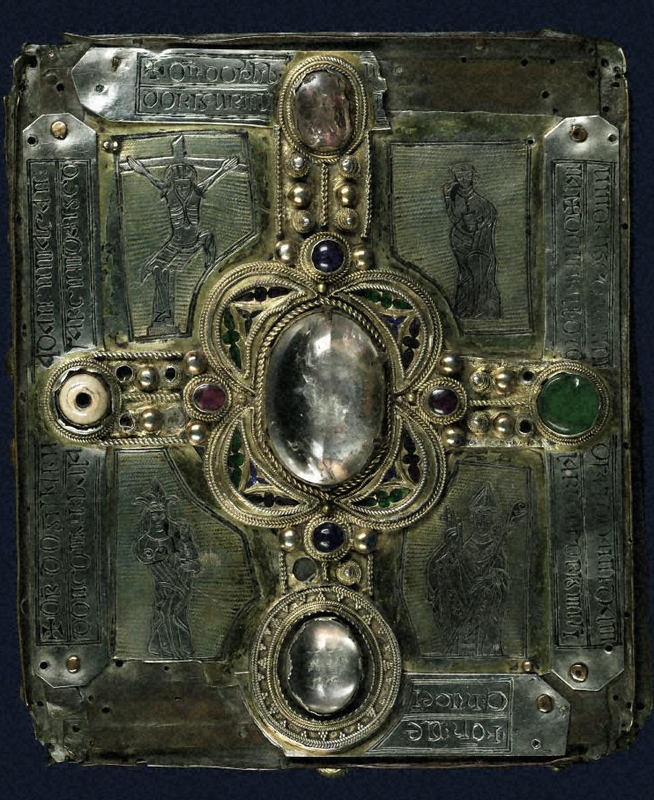 The cumdach often held a small manuscript. The Stowe Missal for which the cumdach in Fig. 2 was made, measures only 150×120 mm, which is a little higher than the iPhone 6 (and a little smaller than the iPhone 6 Plus). The book is very snug inside the box (Fig. 3). The small size matches the object’s anticipated use. The Irish cumdachs were often carried around the neck of a monk who would run up and down in front of the troops right before battle. The book became a charm of sorts, which was to bring fortune in battle. It made good sense to store this ‘secret weapon’ in a sturdy box that could withstand all that bouncing around and even a potential blow of a sword. The most famous of these is the sixth-century Cathach of St Columba, which holds a Psalter from the sixth or seventh century. Curiously, while this cathach (‘battler’) is commonly regarded as an object meant for carrying into battle to ensure victory (source here), it is obviously too big to carry around one’s neck: it measures 270×190 mm and weighs quite a bit. Its user probably ran up and down the battlefield with the book under his arm. Taking your book to battle in a protective box remained popular throughout early-modern history, as shown by the “field Bible” of c. 1700 , which was taken on war campaigns by king Charles II of Sweden (Fig. 4). The satchel was another means to carry your book around in the medieval outdoors. 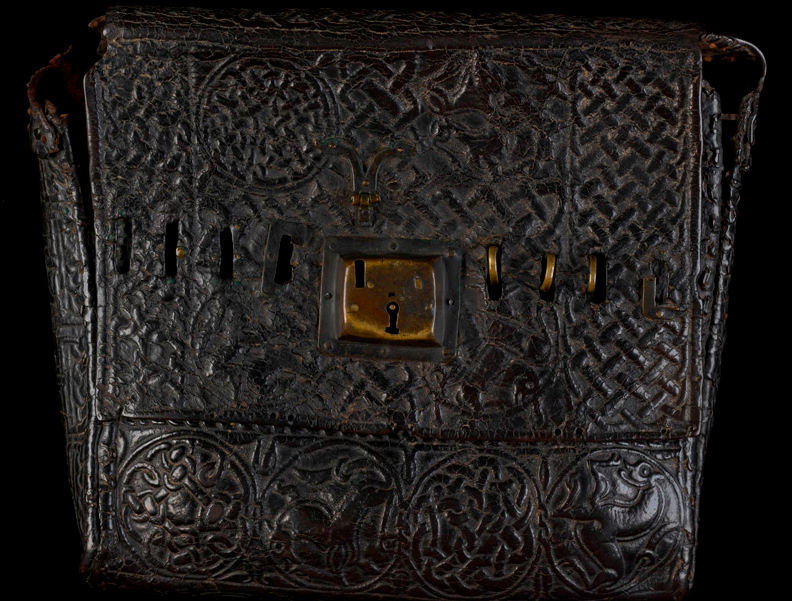 They were made of leather and commonly decorated in the manner seen in the famous 9th-century Book of Armagh – which, curiously, has a modern lock (Figs. 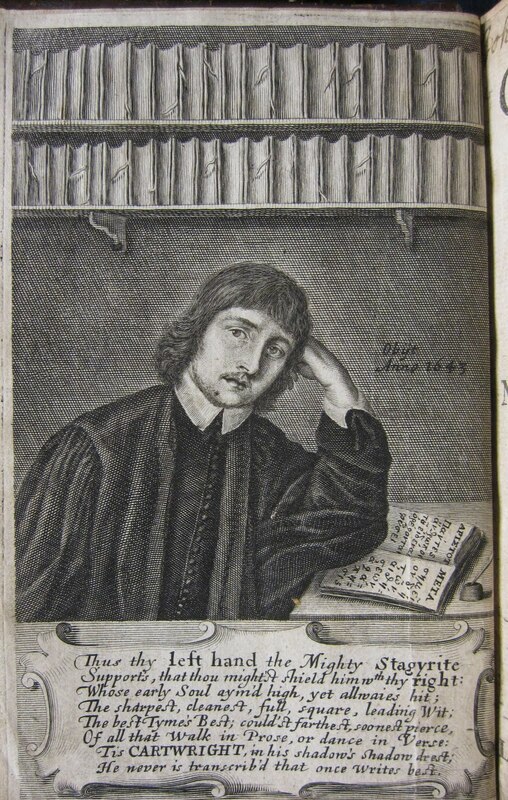 5-6). Very few such satchels survive but we get an inkling of their use and popularity through medieval texts. A seventh-century tract instructs monks to “Hang your white booksacks on the wall, set your lovely satchels in a straight line” (source). It suggests that each member of this particular community owned a satchel. The same text also explains from what animal the leather came (sheep) and how the skin was turned into a bag: take a square piece of leather, sew it closed except for a single opening, which should be closed by a cover fitted with knobs. In 2006 a particularly old specimen was found in a bog, where it had been resting for 1200 years. Around 800 someone had a portable Psalter made, which came with a leather satchel. Somehow the book fell into the remote bog at Faddan More in north Tipperary, Ireland. Restoration revealed a plain but charming example of an early-medieval book bag (Fig. 7). Because it does not feature a strap, this type of satchel bears a striking resemblance to our modern tablet sleeve: unbutton the flap, slide in your reading device, and be on your merry way. Like book boxes, satchels had a life far beyond the Middle ages. Fig. 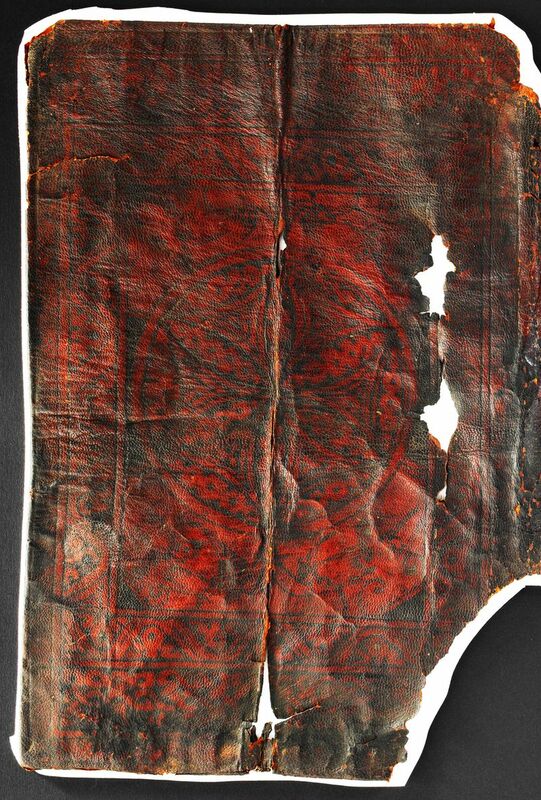 8 shows a 17th-century specimen made of cloth that holds an Arabic devotional book. It belonged to a Turkish soldier captured by Venetian forces in 1668. 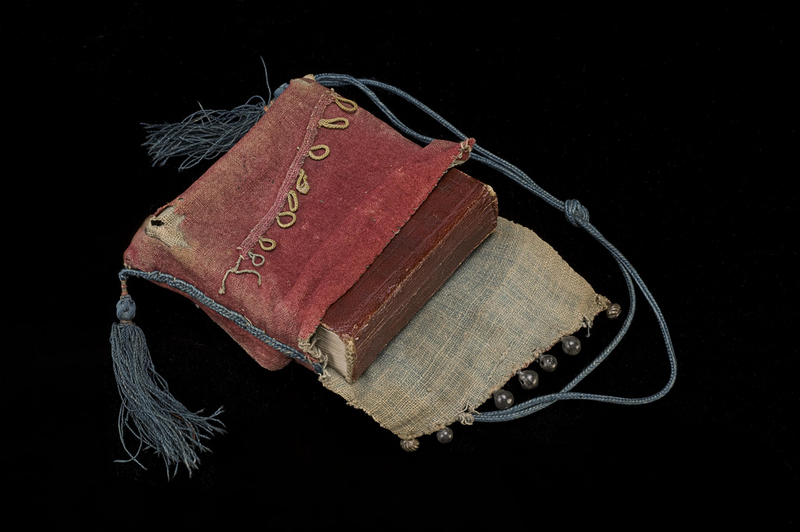 Like the book box, this charming piece of ‘apparel’ carried a religious text into battle, although in this case the book was likely meant for private reading rather than as an aid to victory. 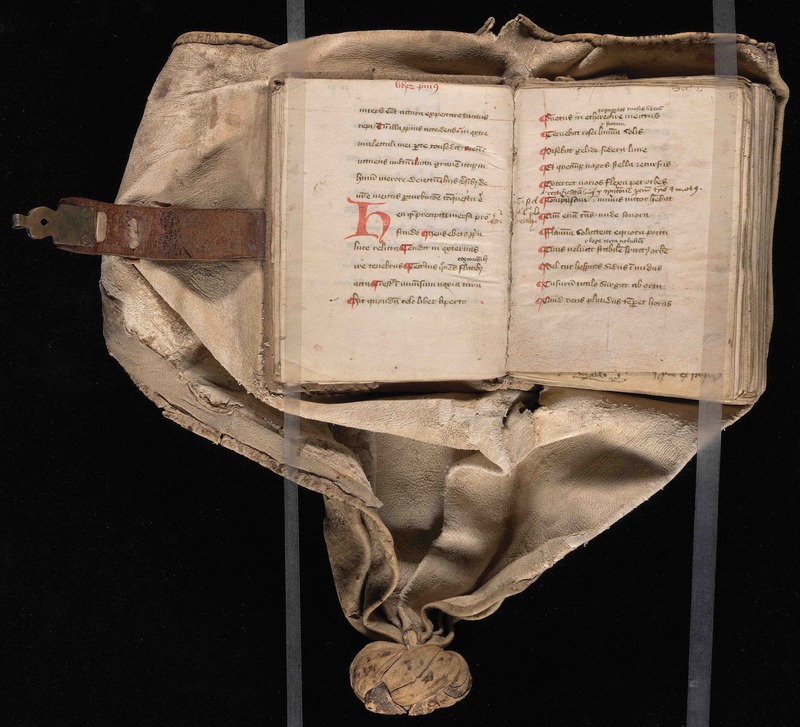 If you wanted to carry your book on your body instead of in a box or bag, for example because you needed to consult the text frequently, the girdle book was your device of choice. The binding of these books came with a wrapper, which kind of flows from the leather of the binding itself. 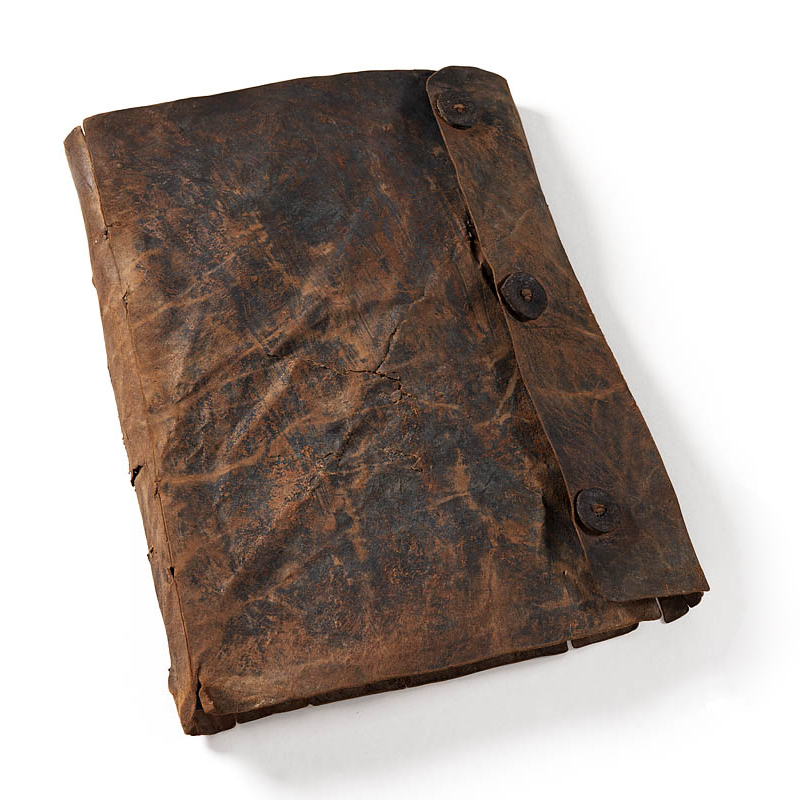 It allowed the user to wrap the manuscript into the leather, which produced a watertight package. A knot was attached to the end of the wrapper. The carrier of the book slipped it under his belt so he could carry the book on his body. 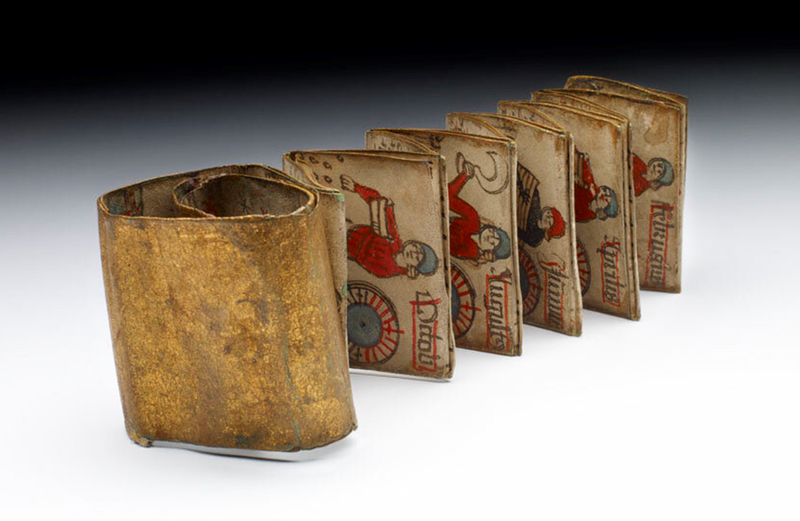 Many of these girdle books are small and light objects, which made it easy to dangle the package from your belt. A particularly well preserved specimen in Yale’s Beinecke library shows how well such wrappers protected the book (Figs. 9-10). This particular book was written in England during the fifteenth century, though the binding may be continental. It measures only 100×80 mm (a little bigger than a credit card) and contains Boethius’ Consolation of Philosophy, a sixth-century text discussing such topics as free will, virtue, and justice. These may not be the usual topics to have ready at hand while walking the streets of a late-medieval city, but someone found such use important enough to have it made portable – and at the ready at all times. 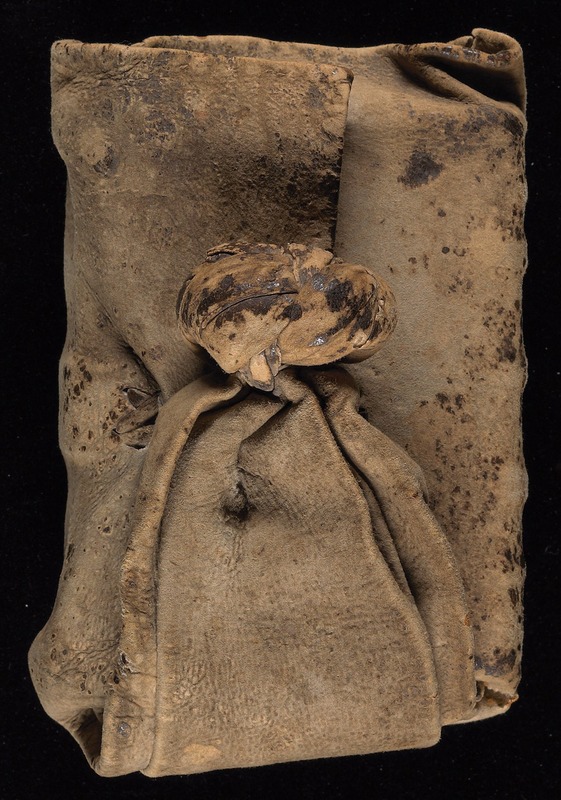 Other girdle books were objects that could be attached to the owner’s belt with a knot, but their wrappers were not meant to protect the book. The wrapper seen in Fig. 11 leaves much of the book exposed to the elements. This book was made in the very late sixteenth century, when the production of girdle books was in decline. By then its protective function may have have been replaced by fashion: exposure – being seen with a book – may well have been what the owner was after. There was a price to pay, however, as the book is too large and heavy to carry around with convenience. In fact, attaching this object to your belt may have cause unwanted exposure as well: there was a good chance the book’s weight brought down your pants. Postscript: this older post shows how medieval texts moved through Europe and how you can tell from barely-visible marginal notes. Books love to hide from us. While you were sure you put your current read on the kitchen table, it turns up next to your comfortable chair in the living room. As you handle more books at the same time, it becomes increasingly challenging to keep track of their location. In the Middle Ages it was even more difficult to locate a specific book. Unlike today, medieval books lacked a standard size, so you couldn’t really make neat piles – which sort of brings order to chaos. Finding a book was also made difficult by the fact that the spine title had not yet been invented. So how did medieval readers locate books, especially when they owned a lot of them? 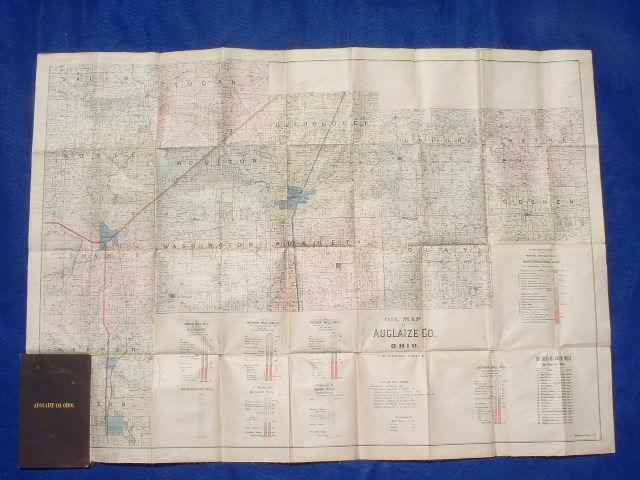 The answer lies in a neat trick that resembles our modern GPS : a book was tagged with a unique identifier (a shelfmark) that was entered into a searchable database (a library catalogue), which could subsequently be consulted with a handheld device (a portable version of the catalogue). 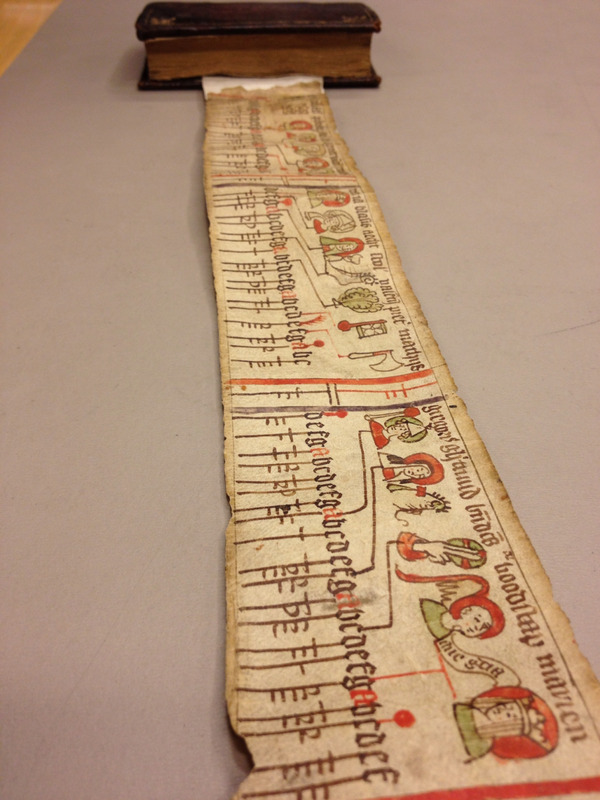 Here is how to plot the route to a specific book in the medieval library. The most effective tool for retrieving a book in medieval times was to give it a number and placing it in the correct sequential order on the shelf. It is still common practice in modern libraries, for good reason: as long as the shelver puts the object back in the right spot, you will be able to find it again quickly. Such book numbers – shelfmarks – come in various forms. The more books a library owned, the more complex the shelfmarks became (had to become, actually). The most simple type merely stated that the book in question was the “twelfth volume” in the cupboard, as seen in the image at the top of this post (British Library, Royal 10 A.xi). Similarly, in small collections books were marked with single letters. In Bethlehem Priory near Brussels each item in the small library of Middle Dutch (i.e. non-Latin) books was given a letter, which was placed on an empty page in front of the manuscript together with a short title. The first volume in this mini library was a late-fourteenth-century copy of works by the mystic Hadewijch (now Ghent, Universiteitsbibliotheek, MS 941). 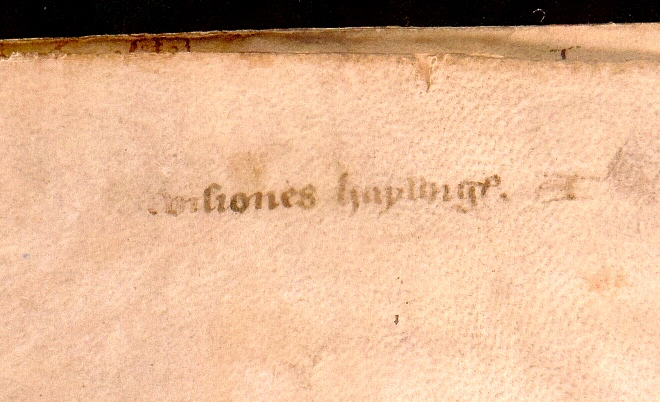 On a flyleaf we can still faintly read “Visiones haywigis. A”, showing it was the first book on the shelf (Fig. 1). 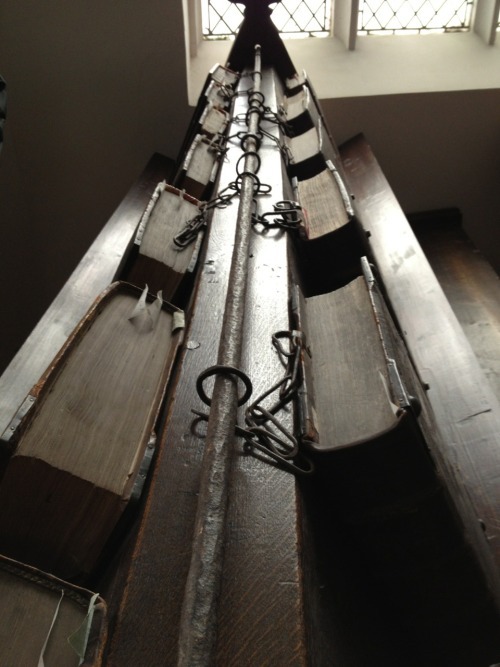 Larger libraries – exceeding 26 books – needed a more sophisticated shelfmark system. 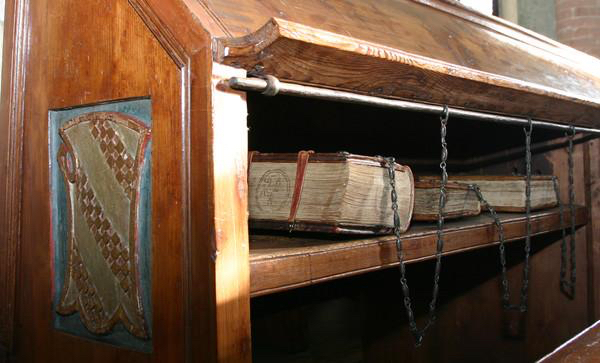 A particularly clever one is found in manuscripts that were placed on lecterns, like those used in chained libraries (Fig. 2). The shelfmarks had two components: a letter pointed to the appropriate lectern, while a number indicated the book’s position on the shelf. Because manuscripts were placed on both sides of the lectern, a bit of color was added – literally – to distinguish between the sides. Red numbers referred to books placed on the right side, black ones to those on the left. The shelfmark tag on the front cover of Lucan’s Pharsalia in Fig. 3 (“Q 2”) is a variation on this theme. Here the letter was made red so as to indicate on what side of the lectern the book was to be placed. It shows that the fifteenth-century owner of the book, the Benedictine Abbey of Egmond, near Amsterdam, owned a lectern library. Much like a modern GPS, the tag “(red) Q 2” ties the manuscript to a unique location: it is the third book on the right side of the sixteenth lectern. Having a location tag is only useful, of course, if there is a searchable database from which the book’s location may be retrieved. How would you otherwise get to Lucan’s Pharsalia in the library, or even know it is present there? The library catalogue is such a database. Up to 1200 the contents list of a monastic library was usually merely an inventory: it marked the presence of a book, but not its location. The later Middle Ages saw a surge of real catalogues, listing books and their location. Some of these catalogues were written out in books (as we will see in a moment), while others were pasted to the wall in the library. A particularly big wall catalogue survives from Lopsen Abbey near Leiden: it originally measured 800×590 mm (Fig. 4). The books in this list are numbered sequentially (1, 2, 3, etc.) within categories such as “libri refectoriales” (books read during the meals) and “libri devoti et utiles” (books for personal, spiritual development). However, there is no clear indication as to where the object may be found (the same in this wall catalogue). Readers had to wander through the library to find the right section and then start counting to find the book they were looking for. Not very efficient. 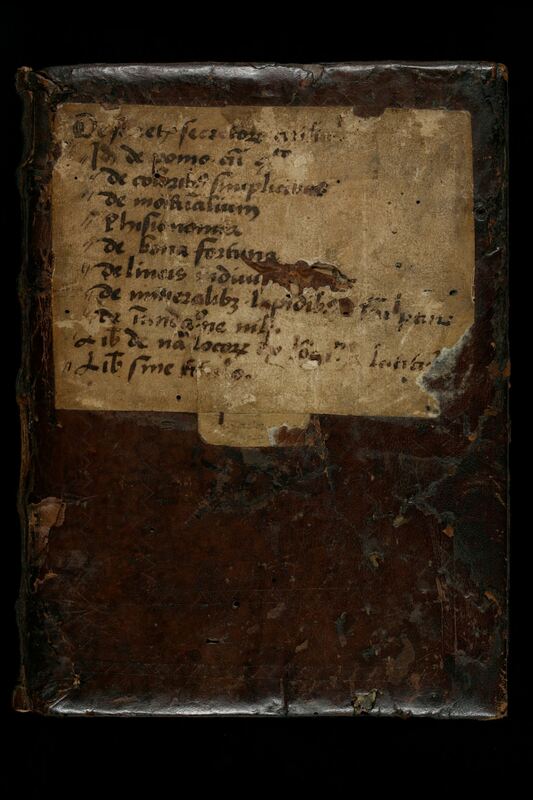 By contrast, other late-medieval catalogues are very clear about the location of a book. From several monastic libraries in the Forest of Soignes just outside of Brussels, catalogues survive that actually refer to the sophisticated type of shelfmark seen in Fig. 3. 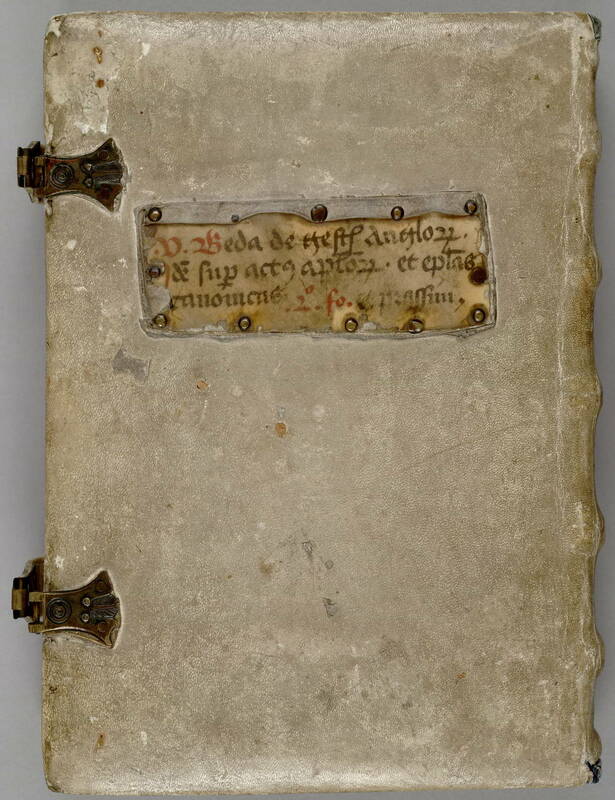 The ones from Zevenborren Priory (now Brussels, Koninklijke Bibliotheek, MSS II 1038 and 7602, both early 16th century) refer to books on both the “black side” and the “red side” of the lectern. The catalogue of the lectern library in another abbey in the forest, nearby Rooklooster Priory, is the cleverest of the lot. It comes in the form of a book with a peculiar shape (now Brussels, Koninklijke Bibliotheek, MS II 152). It is long and narrow, a format that indicates it was made for handheld use, as research has shown. Curiously, the shape of the pages resembles the long inventory slips on the side of book cupboards in chained libraries (see the wooden frames clearly visible in Fig. 5). The hand-held Rooklooster catalogue must have been copied directly from such slips on the side of the lecterns. What a clever tool the user ended up with. The open catalogue in his hand presented two columns, one for books on the “black” (left-hand side) side of the lectern, another for books on the “red” (right-hand) side. Moreover, each column is divided into two halves. The top half lists books placed on the upper shelf of the lectern, the lower half those on the lower shelf (these shelves were placed under the lectern, as seen in Fig. 6). Standing in front of a lectern with his handheld device, the reader knew precisely which of the volumes in front of him was the one he was looking for: he could identify it without even opening it. 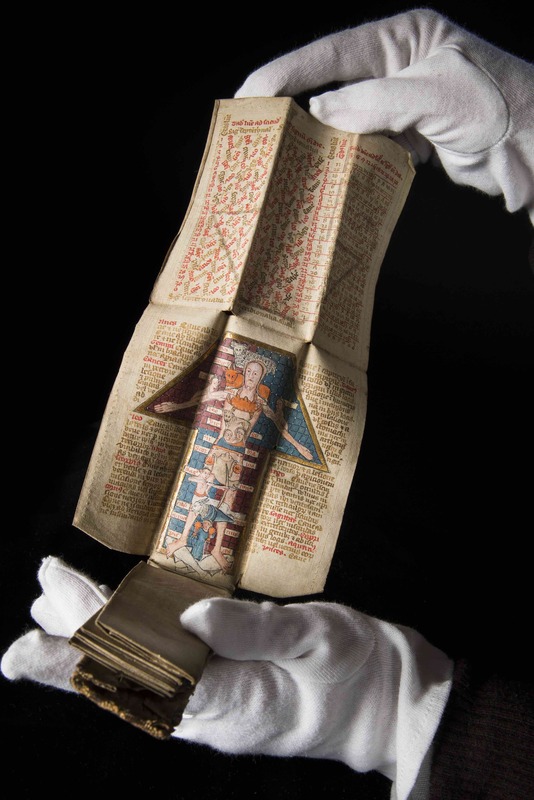 This particular medieval catalogue is not unlike a modern navigation system, with “GPS coordinates” directing readers to such works as Ambrose on the Psalms (Black A 1) and Augustine’s Civitate Dei (Red A 5). The only difference is that it never ran out of batteries. Every book needs a coat, a protective layer. Without it, after all, the pages would be exposed to the elements and the dirty hands of readers. And so from the very early days of the book the object was given a binding. Medieval bindings mostly consist of two components: boards, commonly made out of wood (but in the later Middle Ages also from compressed paper), and something to cover the boards with. While in medieval times the most common covering material was leather, there is great variation observed in the kind that was used, as well as how it was decorated. Readers and reading communities had their own preferences in this regard. As a result one can “read” as much from the outside of the book as from its pages: they both transmit important cultural-historical information. Here is a post with an exotic twist, which includes bindings made from seal and human skin. Most medieval bindings were made out of animal skin: usually it was a calf or pig who involuntarily ended up protecting the manuscript. 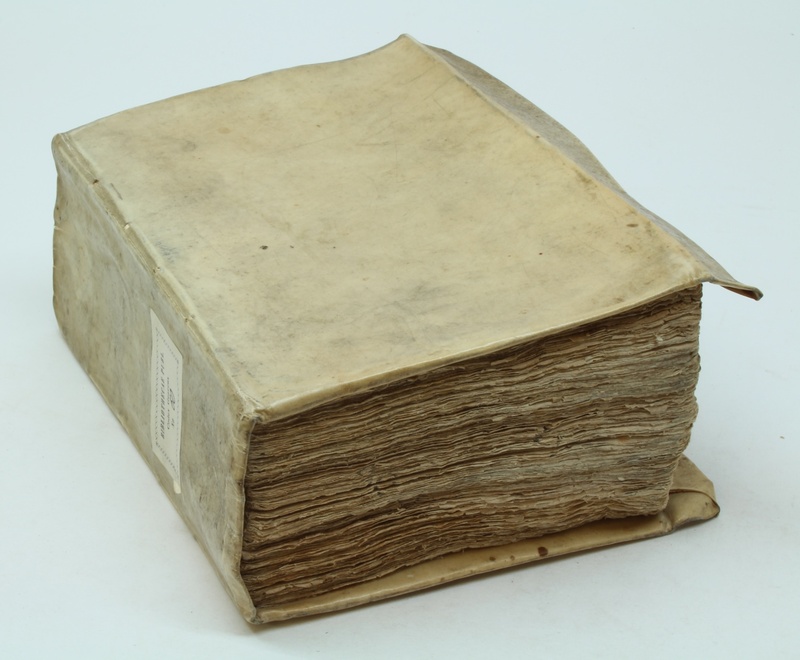 Leather proved an ideal material for binding books. The material is stiff, which means it does an excellent job protecting the precious cargo inside, while at the same time adding to the desired “firmness” of the book. The material also repels water quite well. This benefit may seem odd, but it’s not. While monks may not have been reading books in the bath tub, they did consult them in the cloister, which was often a damp environment – given that the hallways were in the open air. An added bonus of leather was that it accommodated blind-tooled decoration, which was applied in mesmerising shapes and patterns. 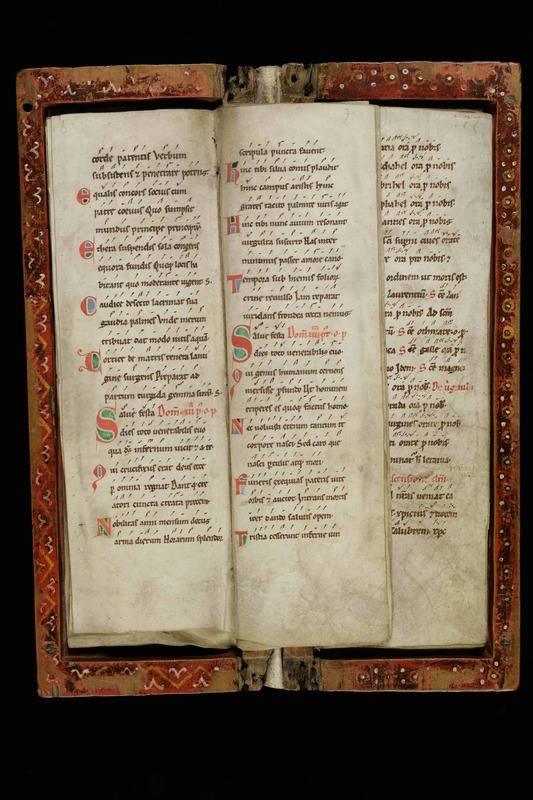 The oldest book to survive with its original binding still in place is the seventh-century St Cuthbert Gospel (which is a Gospel of John, in fact). 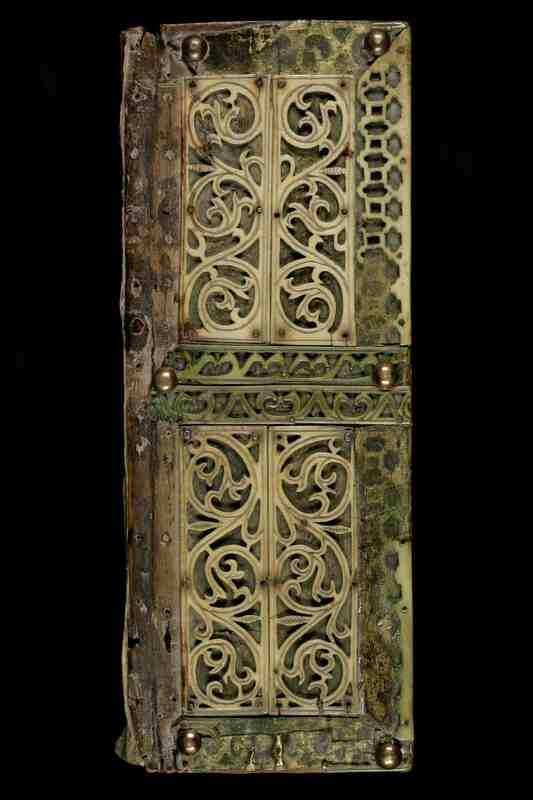 It shows just how utterly charming early-medieval leather bindings were; and how beautifully they were decorated (Fig. 1). The manuscript in question was placed in the coffin of St Cuthbert shortly after his death in 687. It was discovered when the grave was opened in the early twelfth century. Because by then a cult had grown around St Cuthbert, the book – and its original binding – was well taken care of. In fact, the binding looks like it was made yesterday. 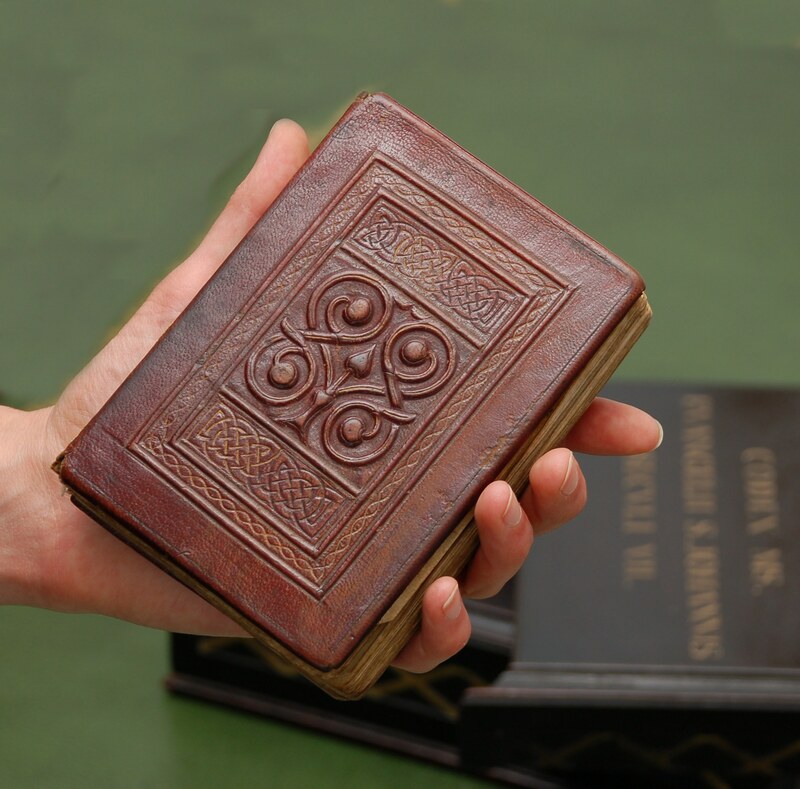 The use of leather bindings predates books made out of parchment – like the book of St Cuthbert. 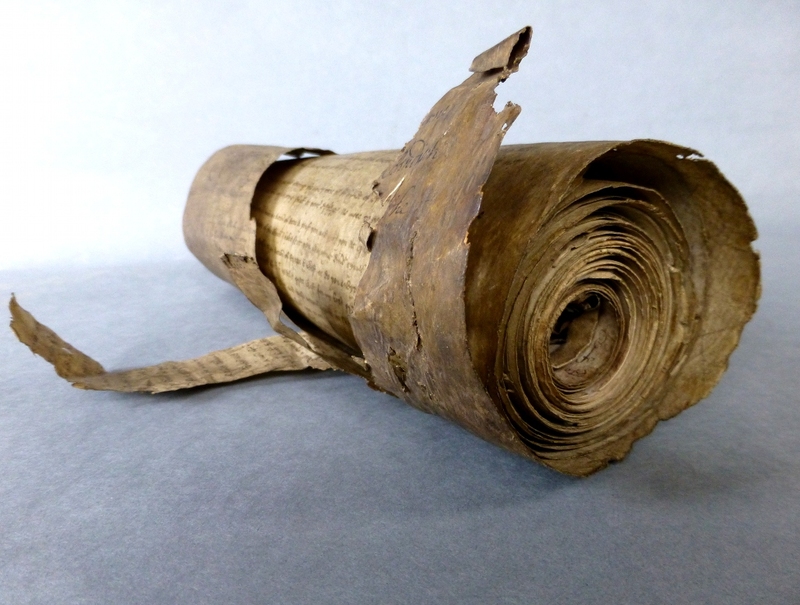 Before parchment became common, books were made from plants – papyrus. Such papyrus codices were extremely fragile and they needed the protective qualities of leather, which may ultimately be the origins of the tradition of using skin for bindings (Fig. 2). Given that papyrus became in disuse after the fifth century (with some exceptions), very few original bindings of papyrus books survive. The oldest specimens we have are those in the so-called Nag Hammadi Archive, which date back to the third and fourth centuries (look at some images here). As you can see from Fig. 2, these covers of papyrus books were also decorated handsomely. What to do if you need a leather binding, but there are no cows or pigs to slaughter for this purpose? The answer is seen in Fig. 3, which shows a book that was copied and bound in Iceland. Naturally the binder turned to creatures that were available there. 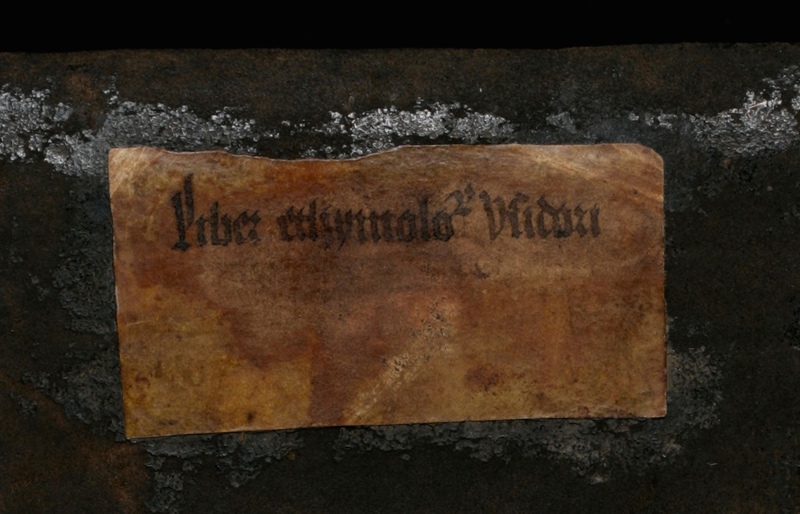 This is how a poor seal ended up covering this Old Icelandic book with sermons, which was made around 1200. If you look carefully you can still see a significant amount of hair on the outside. As with other cases where animal hair is found on book covers, the hairs have turned green over time – or perhaps from the liquids involved in processing animal skin into leather. The story gets even more graphic. 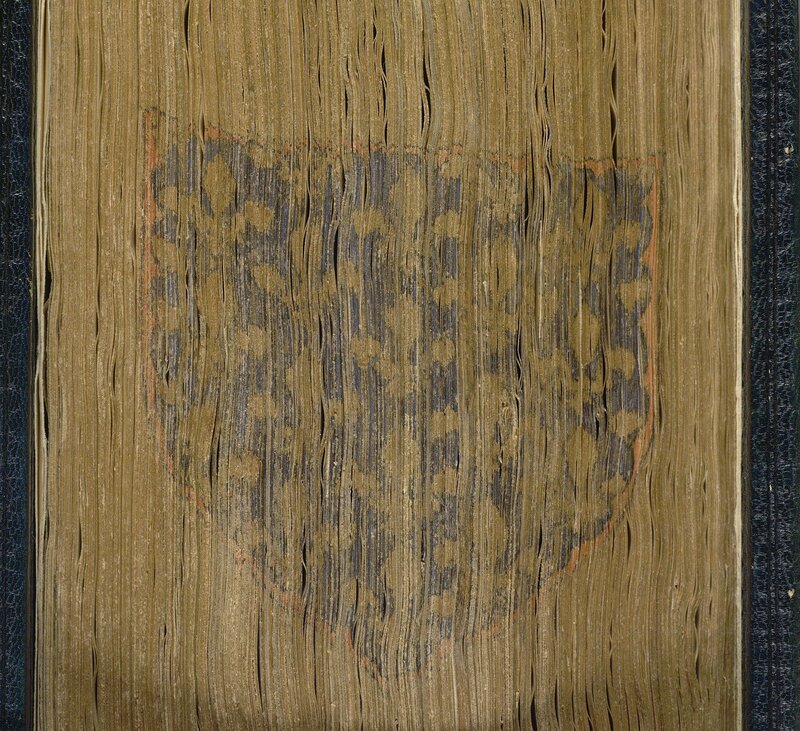 The skin used for bookbindings is not limited to animals. 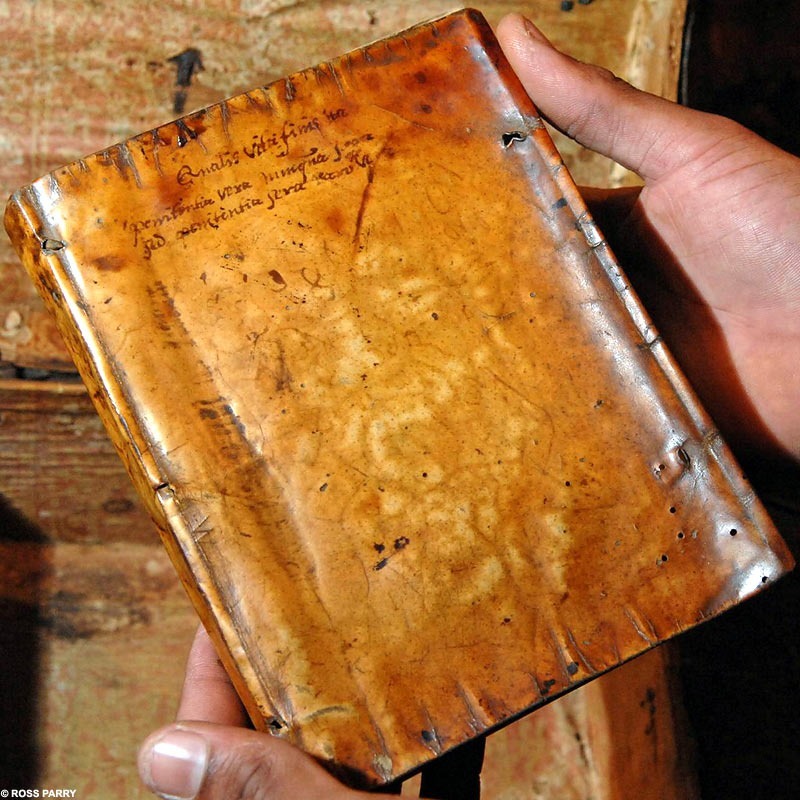 Under the name anthropdermic bibliopegy goes the practice of using human skin for binding books. Perhaps surprisingly, it turns out to be a post-medieval practice, particularly popular in the 17th and 18th centuries. The cover seen in Fig. 4 dates from the early 17th century and the skin was taken from the priest Father Henry Garnet. He was executed in 1606 for his role in the Gunpowder Plot, the attempt to ignite 36 barrels of gunpowder under the British Parliament. The book in question actually outlines the story of the plot and the evidence of Garnet’s guilt (more on this book here and here). The origins of the binding must have given the reader significant satisfaction. Not all medieval books were dressed up in leather. Less commonly used, perhaps because it is more fragile, is cloth. This material handled the frequent use of a book far less well than leather. 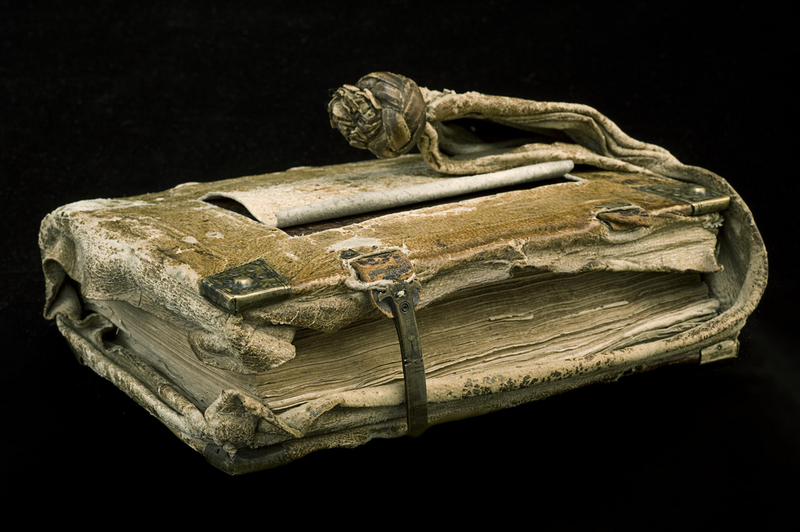 The real-world use of a medieval book was such that the object would be pushed back and forth over a wooden desk, which did not exactly contribute to a long life. 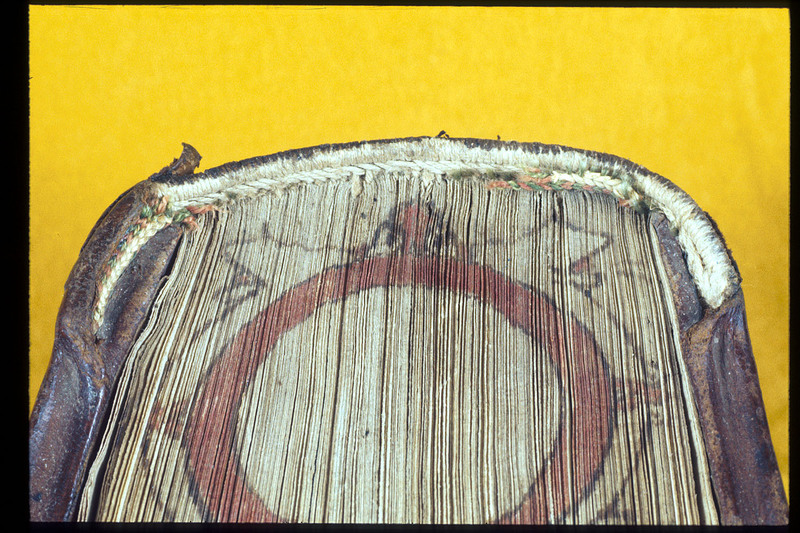 The cloth binding seen in Fig. 5 dates from the middle of the fifteenth century and it covers a monastic rule. The manuscript has a particularly pretty button to close the volume up (see image at top of blog), adding further to the charm of this beautiful bookbinding. In the age of the printed book such cloth bindings (and embroidered ones) became more common, perhaps because increasingly more books became owned privately. This meant, of course, that the objects were not consulted on the hard surface of a wooden desk, but on the soft lap of the reader. As with embroidered bindings, which also increased in popularity in post-medieval times, cloth may have been regarded as a more suitable material for private reading. In tune with the dressing code for medieval books, the objects knew when to slip into something more comfortable. Note – This blog post tells you more about leather bindings; it includes some great images as well.